Eat pistachios raw or include them in other dishes such as rice, salads and pastries. Raw pistachios have a reputation for being high in calories and fattening, but much of their fat content is considered healthy and they contain almost no cholesterol or sodium. 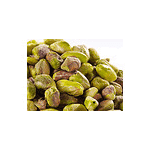 Pistachios have high nutritional value and can be considered a healthy snack if you consume them in moderation.